Gamelan is the traditional music of Indonesia. An ensemble includes gongs, metallophones and drums of various shapes and sizes, which are mounted on beautifully carved and painted wooden frames. The instruments look and sound amazing, and playing them is a unique and special experience. A Gamelan workshop is a great introduction to group music-making for children and adults of any age, whatever your level of musical ability. The straightforward playing technique makes these instruments instantly accessible, and everyone can learn to play because no previous knowledge or experience is required. Learning to play gamelan enriches many areas of music-making, and the emphasis on playing together as a group reinforces the importance of community over individual values. Workshops are fully accessible and suitable for pupils in KS2 and above, including SEND. Some state schools will be entitled to a subsidised workshop and/or travel subsidy. New for 2019 We now offer a 10 week WCET (whole class ensemble tuition) exploring tuned percussion, led by specifically trained tutors. The 10 week programme comprises 8 classroom sessions bookended by a gamelan workshop in week 1, and a final performance by the pupils, both at Gloucestershire Academy of Music (GAM). 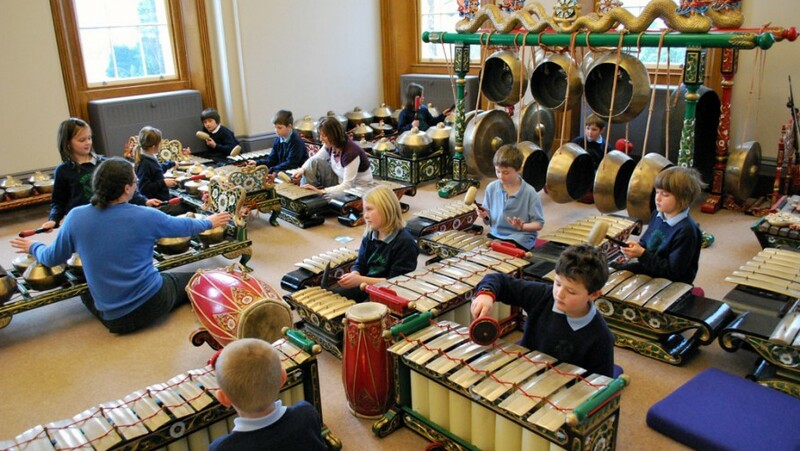 A classroom set of tuned percussion can be provided. In addition to workshops for schools, we can offer sessions for community groups, bespoke team-building opportunities for businesses, or even a birthday party for you and your friends! For all other enquiries including the Community Gamelan Players, email education@cheltenhamfestivals.com or phone 01242 537267.